By the way, I'd like to thank everyone who's left a comment or wrote an email to thank me for posting my images in the past. It means the world to know that you love and appreciate these vintage treasures as much as I do. 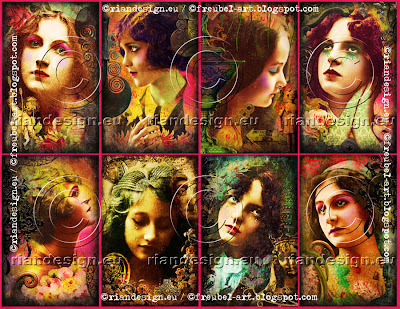 Special thanks to my dear friend, Rian at Freubel-Art for this beautiful collage sheet. I was one of the lucky winners in her One World One Heart giveaway. Rian is an amazing digital artist, and I have the utmost respect and admiration for her beautiful work. 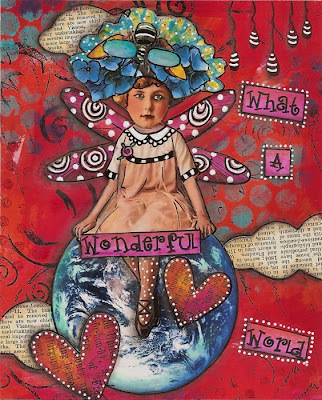 She also creates awesome digital collage sheets. If you'd like to visit Rian's blog (one of my faves! ), you can click here. Thank you, Rian! Credits: To my knowledge this image is in the public domain. Journal Prompt: What do you love? One of the advantages of being in an art group is the challenges. They're always interesting and different, and each one encourages me to spread my wings . . . . . always creatively and sometimes spiritually. This month's prompt: "What do you love?" posed a conundrum. Of course, I love my family, friends and my dog. 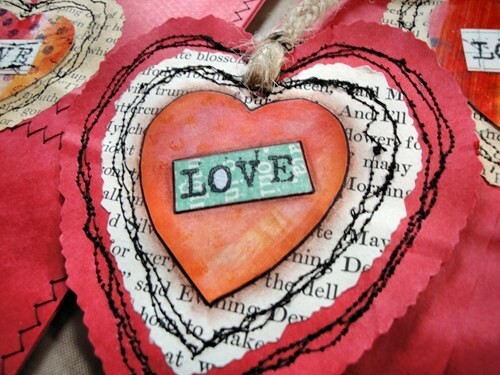 Gardening, photography and art are additional items on my "love" list. Then I thought of a different twist and expanded the question to "What do I love that makes me feel terrific?" 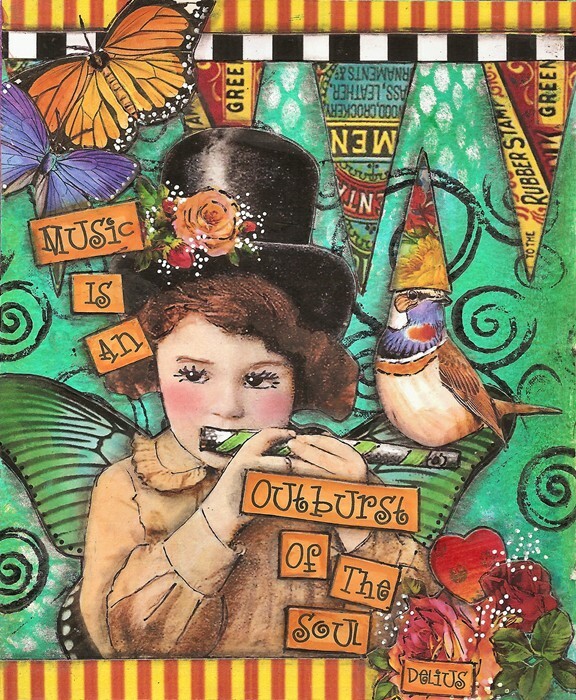 Music was my resounding answer. Although I've never played an instrument (I've always wanted to play the piano), I truly appreciate the power of music and can't imagine my day without it. It elevates my mood when I'm feeling down, and soothes my spirit. It makes me dance with happiness or cry with emotion. Like art, music is food for my soul. Quite simply, I love music! Wishing you a day filled with the things you love! Credits: Thanks to Tumble Fish Studio-Etsy for the borders, banners and the little bird's hat. Butterflies and bird from Dover Publications. Roses are from the public domain. 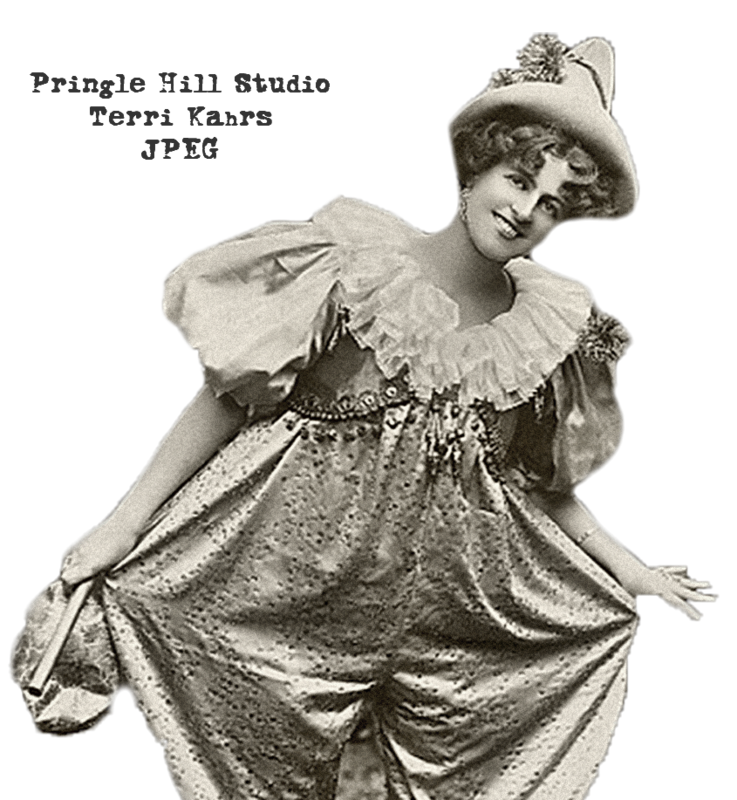 Image of child, background and heart from Pringle Hill Studio. Here's another quick background technique that Roc and I had a lot of fun with. You can create awesome backgrounds for your art projects and journals by using simple things you might be throwing away as art "tools". It's a great way to "go green" with your art! Wishing you a "green" day! I must begin this post by thanking our hostess, Lisa Swifka - A Whimsical Bohemian, for hosting this fabulous event. The past few weeks have been a blur of Blogland activity, and today is the big day for announcing the lucky winners. Without further ado . . . . the winner of my giveaway (you can see my gifts by clicking here) is Marit of MaritsPaperWorld! Congratulations, Marit! 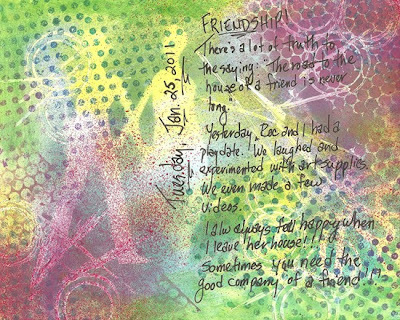 You can visit Marit's blog to see her fabulous art if you click here. My sincere thanks to all of the visitors who stopped by during the "One World One Heart" event. I was overwhelmed by your lovely comments and truly appreciate each and every one of them. 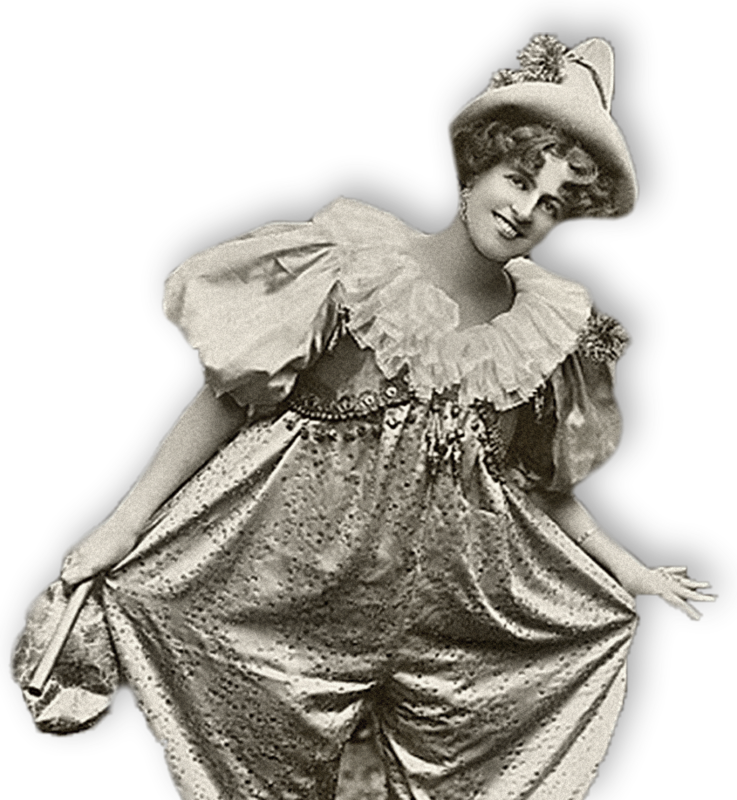 Also, a huge, heartfelt "hug" to all of my followers - both old and new. You are the wind beneath my creative wings, and I am very grateful for your visits, comments and support. Thank you! With love and heartfelt gratitude! 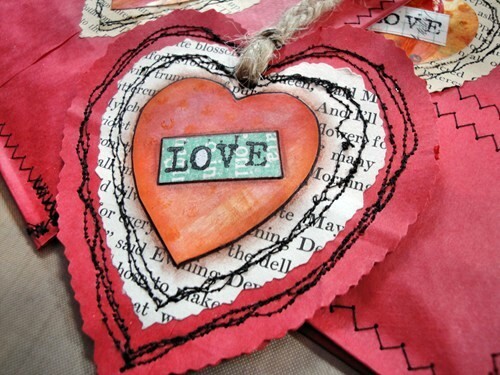 Valentine's Day always brings fond childhood memories of scissors, paste, embellishments and red construction paper waiting to be transformed into happy greetings of "love". 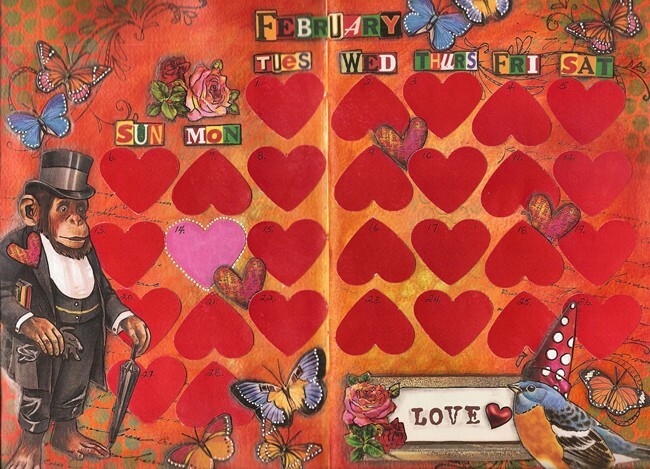 I remember the large, decorated paper box that sat in the front of the classroom when I was a child, and how exciting it was to receive a handmade Valentine from a special admirer. 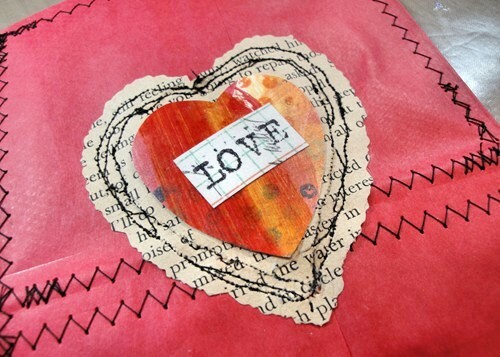 Inspired by those thoughts, my Valentines this year are paper heart ornaments created by using red lunch bags, a few vintage book pages, scrap paper hearts, stamps, tape, twine and a sewing machine. It was a great little project to practice "free motion" stitching for the first time. 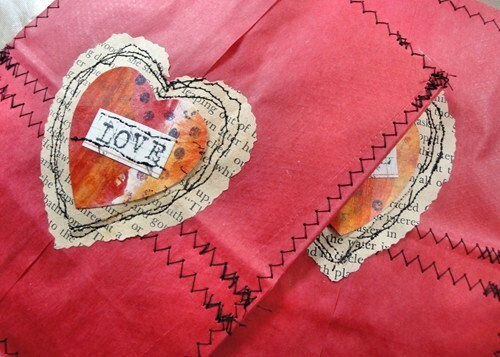 And, of course, these special Valentine treats need to be presented in a special way, so I sewed some paper gift bags too! A few weeks ago, Roc and I had another opportunity for a play date, and recorded this short video. If you've always wondered how those soft, misty backgrounds are created, this is an easy technique to try. A quick word of caution . . . before you start using this technique, be sure to cover and protect your workspace from any overspray. 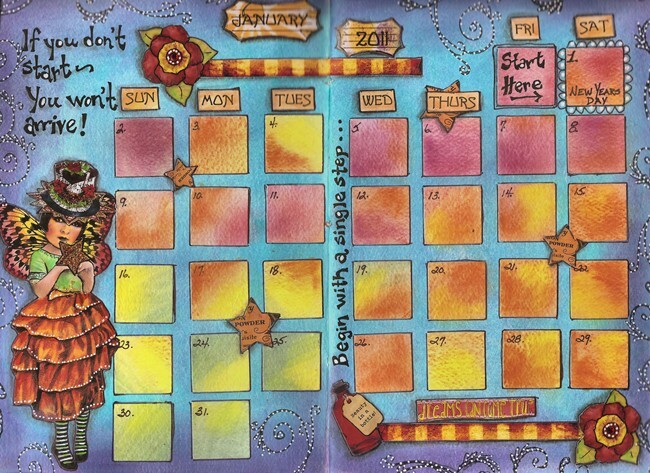 Thought you would like to see how the page in the video looks with additional color and some journaling. This simple, yet very effective technique, resulted in quite a different "look" for me! May you enjoy a very creative day! Since our Winter world has been colored with white snow and gray skies, my February journal page is filled with bright, zesty, vibrant color. I've already completed seven days; and every time I open my journal to this page, it brings a smile. Awww . . . . the joy and magic of beautiful color! May your day be colored with joy! Credits: Thanks to Freubel for the chimpanzee and to Tumble Fish Studio-Etsy for the month, the days of the week, the little hearts and the bird's hat. Butterflies and bird from Dover Publications. 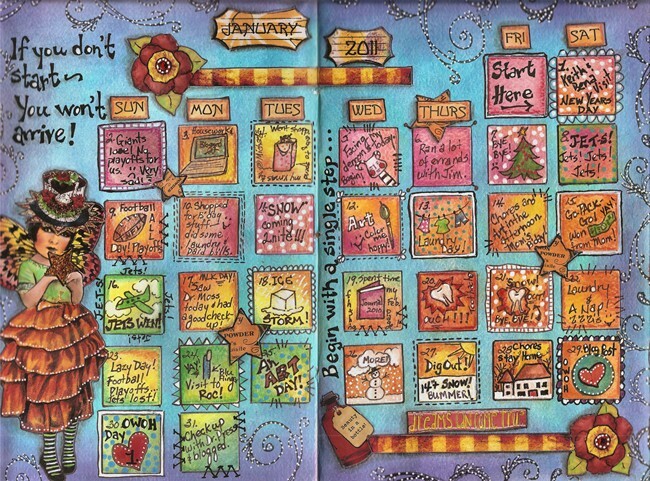 Thought you might enjoy a peek at my finished calendar page for January. I must admit . . . I'm very proud of myself for keeping my commitment and journaling a little "inchie" every day. It didn't take a whole lot of time, and fulfilled my need for a quick "art fix" to start my day. May your days be colored with happiness!